I have sat through many presentations in my life, both at work and outside of the office, and there’s nothing worse than a boring one that doesn’t engage the audience. A friend in my French club still chuckles when he remembers us siting together listening to a lecture given by a professor from an esteemed French university on a topic that I can’t even remember. The only thing I do remember is the monotone voice of the speaker (think of Ben Stein’s character in “Ferris Beuhller’s Day Off,” but with a “vehr-ee” French accent) droning on for two hours with what seemed like one thousand slides of the same stone building. About an hour into it, my friend leaned over and asked me what I thought. “I’d rather gnaw my arm off than listen to this right now,” I replied. And I meant it. It doesn’t matter what field you’re in – nearly every vocation requires that you put together a presentation at some point. Today’s universal presentation tool seems to be Power Point, though Prezi is gaining strength as a nice alternative, but it can be time-consuming and costly (in terms of resources) to create. It still always astounds me that, in this day and age of competing distractions and vying for those precious few minutes of a prospect’s time, there are still presenters who flub their presentations – usually by making them too long and by not dynamically presenting the information. What’s worse is that the attention span of the average human adult has decreased from 12 seconds in 2000 to 8 seconds in 2012. (source: http://statisticbrain.com/attention-span-statistics/ ). 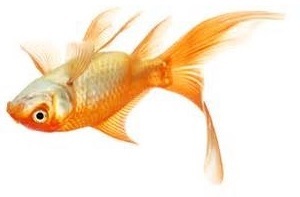 Even more disturbing is that goldfish have attention spans of 9 seconds – that’s one second longer than people!! More so than ever, presentations have to be brief but engaging. Including too much content – The mantra of presentations is not “more is better.” It’s always a real challenge not to overload your presentation with lots of information and corresponding slides. I know you have a lot of points to get across, but you need to really create a succinct presentation that is tight and to the point. I typically go back at least three times to edit out any redundant info as well as to streamline slides. Let’s face it, do you enjoy sitting through a 70-slide Power Point presentation? If not, why would your audience? Being too copy-heavy – Not only do you have too much content, but the content you do have is all text with no visuals to break up the monotony. It’s beneficial to pepper your presentation with some relevant visuals or videos; perhaps a chart or images that make sense in order to help you drive your point home. And, if you don’t have any relevant visuals, just intermittently stick in some pictures of cute baby animals such as puppies or bunnies. How can people not like that? Reading entirely off of the slides – If you are just going to read the slides, then you don’t even need to even be there – just run the presentation with a cardboard cut-out of yourself and have the audience read it themselves. Remember that the slides are there merely as a guide and road map to help you verbalize and expound upon the key information you want to convey. Don’t rely on your slides to present (what if the computer or AV system was down). Not practicing beforehand – I’ve seen and experienced this firsthand myself. I realize it’s difficult since many times, we actually finish the presentation at the eleventh hour and find ourselves with no time to practice. Additionally, some folks think that because they wrote the presentation, that they know it and needn’t practice. Not so. Practice is especially crucial when multiple people are presenting. Ignoring the human factor – To me, this is the most important point of all. Most of the time, such as in new business situations, the reason you are presenting in person is for your prospect to test the chemistry between potential team members. A presentation with excellent content is only as good as the person(s) presenting it. That means looking at audience members as you speak as well as reading non-verbal cues from them to see if you are going to fast or confusing them. Engage your audience – don’t just talk at them. While these tips seem to be logical and innate, we’ve all experienced sitting through a presentation that includes one or more of these no-no’s. Don’t be that person – the one who makes the audience so disengaged that they begin seeking refuge by gazing out the window or checking their emails; or worse yet, begin gnawing at their arms. And, if the goldfish in the room is floating at the top of the bowl, you know you really bombed.